1. Mix the flour, bicarbonate of soda, cinnamon and a pinch of salt in a bowl. Make a well in the centre, then gradually beat in the eggs, followed by 300g of the yogurt and the melted butter. Stir in the grated apples and sultanas. 3. 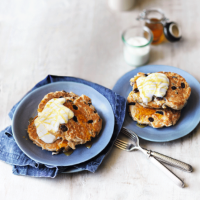 Stack 3 pancakes on each plate and top each with a spoonful of yogurt and a drizzle of honey. briefly in a microwave or dry frying pan before serving.